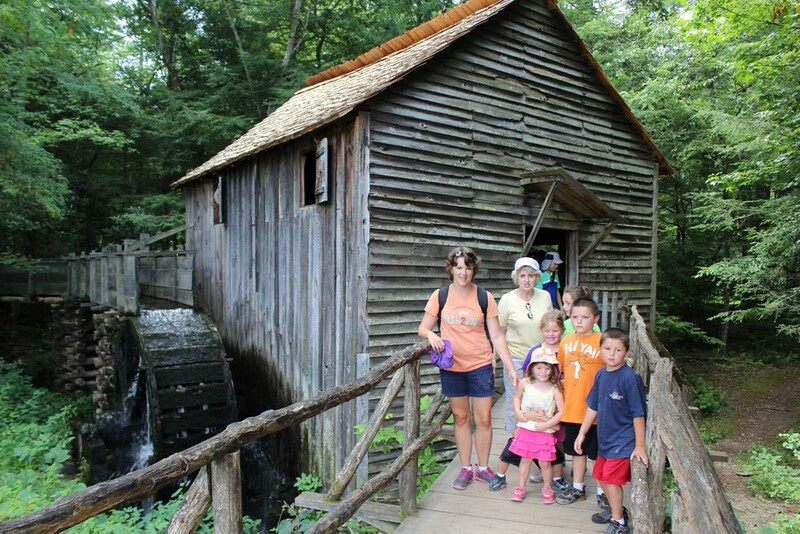 Visiting the mill at Cades Cove in Great Smoky Mtns National Park! I guess that Santa really enjoyed talking to the kids last night because he delivered presents to our room this morning. Can you imagine Graham's delight when he looked under our Christmas tree in the room and saw that it was filled with presents? Presents for Nonna, Pops, Robby, me and all the kids. Graham climbed on top of Anderson and said "Santa came, Santa came!" Anderson just rolled over and Graham shouted "I'm not kidding!" It didn't take much for them to put on their clothes so they could go and get the girls. When everyone had eaten their fill in breakfast goodies, we headed out to the lobby to meet Mrs. Claus. This Mrs. Claus must have been real because she looked just like she should and was just so sweet. While we were getting everything ready, Graham hung out with Pops and they talked some more to Mrs. Claus. Graham told her everywhere that we had been on our trip and suggested that maybe Santa bring more presents in the morning. Mrs. Claus laughed and said "well, maybe that is too short of notice." We soon joined everyone else in Gatlinburg and all of the surrounding towns and headed to the Smokey Mountain National Park. It is the most visited National Park in the US and I certainly believe it. We stopped at the visitor's center and watched a bit of the movie and just when Whitman crawled into my lap and snuggled up with me for us (yes, I said us) both to take a nap, the movie was over! We could have had a good little cat nap if that movie would have been 10 minutes longer. The stop at Cade's Cove that was the most interesting to my crew was the mill. They had corn and cornmeal and wheat and flour for the kids to touch. They were also able to see the mill spinning the grinder and then outside, the big trough of water leading up to the wheel was super exciting to my boys-especially Whitman. Then we walked on to the stream and happily stuck our hands in the water (and threatened the children with no swimming if they got their shoes wet) Robby was able to take some pictures of the kids and when you are in a beautiful place like where we were today, I could us imagine us all sitting down for a perfect family photo. In my mind, I can see all of the kids looking directly at the camera with their hands placed lovingly on their siblings shoulders or holding hands, Robby and I looking 10 years younger and 20 pounds lighter, our hair blowing not in our faces but out behind us and a beautiful rainbow or eagle appearing just as the picture was taken. But instead if we were to take a picture sitting near the stream today Keaton would have had her hands on her face and a crazy smile, Graham would have been sticking his chest out, Reagan would have been shouting at Whitman who would have been possibly laying on the ground crying, Anderson would have been sneezing and goodness knows what Campbell would have been doing, Robby and I would look like we really do look and someone would have probably fallen in the water....so we didn't take a family picture today. Robby is just going to combine all of our pictures from the trip and make it look like we really took a picture together. It took us forever to get back to civilization-forever. Robby stayed on the main drag and the GPS was made at him the entire time and constantly kept making our time to destination go higher. Finally we made it to the Applewood Restaurant. I had been waiting to eat here for a long time and it was almost as good as I remembered it. I probably have always liked this restaurant so much because when you it down they give you apple juice and apple fritters. And goodness knows, that was a big hit at our table. Anderson was not going to try the apple fritters but we convinced him and he was so glad that he did. I wish that the food had more apple stuff in it but overall it was good enough that we were too stuffed to buy ice cream there! (and that is really saying a lot!) We did have the energy to walk around the gift shop for a few minutes before heading back to the hotel. Next up was swimming-lots of swimming. Whitman even went down the slide a few times and then he has started "swimming" by himself (and the help of his life jacket). He will kick his feet and say "I swimming, I swimming." Of course this "swimming" is usually followed by a brief period of swallowing some water. We swam and swam until it was almost past our ice cream time so we had to hurry out of the pool and get our clothes on quickly to make it across the street for ice cream. Back to the pool today: there was a bully there. It was quite interesting to watch too and really, it was good for the kids to deal with a bully since that is life! The kid would cut every time in front of Graham when they were in line for the slide. Graham would get so made and holler at the kid "why you gotta cut?" I tried to explain to Graham to be nice and to not let that boy ruin his day. One time it happened, Campbell was nearby and she just shoved the kid on down the slide. When the kids mom came to pick him up from the pool, I real show unfolded and I quickly pointed out to Graham to notice how the boy talks to his mom, how the mom talks to the boy and that is the reason that he acts like he does. Back to ice cream-we walked to a Marble Slab across the street and all split a few different flavors before rushing back to the hotel to roast marshmallows. This hotel is a little like staying at a Disney World hotel-roasting marshmallows, themed rooms and hallways, characters, crafts. The marshmallows were fun but of course we needed to top them off with some cookies and lemonade from the lobby. Then it was back to our rooms for a quick change into our pajamas and then bed for everyone. The big boys stayed with Nonna and Pops and everyone else slept in our room. It was another great day and Robby and I are getting a bit depressed that this trip is almost over. Maine to North Carolina is next year-anyone want to come? And one last story: tonight when we were roasting marshmallows, the worker asked Campbell where she was from and then how long it took her to drive here. I answered for Campbell and said that we had been gone for about 17 days and then the lady asked where all Campbell had been. She could only think of "Pennsylvania" to say and then the lady asked "what was your favorite place?" My Campbell could have answered "Washington D.C., Hershey, Niagara Falls, Henry Ford, Corvette Museum, Grandfather Mountain" and the list could go on. But Campbell quickly and confidently answered "Krispy Kreme"-we haven't even been to Krispy Kreme on this trip! !